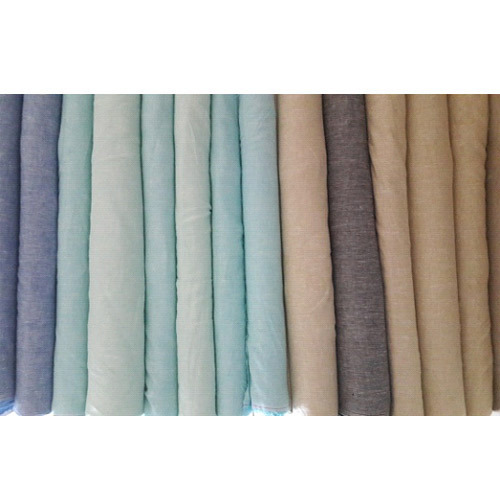 We are offering an impeccable collection of Linen Fabrics to our esteemed clients. The offered fabrics are woven by making use of supreme quality yarns sourced from the reliable vendors of the industry. Furthermore, these fabrics are tested in accordance with the well-defined quality parameters of the industry. Our valuable clients can easily avail this collection at market leading prices and within the promised time-frame. Established since 2015, Khoday Inc. has evolved as one of the leading organizations engaged in manufacturing and exporting of exclusive Decorative home textile fabrics, made-ups in silk and silk blends, polyesters, Linen and also fashion fabrics. Our gamut of Yarn products, Animal Digital Print and Block Print Viscose is available with us at highly reasonable market prices, these silk fabric products are known for their fine finish, soft texture and trendy designs. Our collection is available in different styles, vivacious colors and innumerable variations that add grace and elegance. Our range of silk fabrics and home furnishings is made available in a spectrum of designs and patterns to suit the prevailing tastes of the clients. Moreover, our customer-centric as well as quality-focused business policies have been enabled us to muster many esteemed clients in this competitive market. We are known in the industry for long-term and mutually beneficial relationships which is the reason behind our huge clientele base. We have built a state-of-the-art infrastructure setup, which enables us to manage and handle all the given resources in an efficient manner. This helps us to churn productive solutions out of each given project assigned to us. Working as a uniform unit, the team of experienced professionals and other skilled employees give their 100% effort in order to accomplish the entire assigned project in the stipulated period. Most importantly, we make sure to test the aforesaid products on various quality parameters before dispatching them to valued clients. Subsequently, this has helped us to gain the trust of valued clients, and earn a prolific place at international and national level.